Flower girls are cute additions to the bridal party, they can either follow the bridal party down the aisle or the maid of honour, or even the bride. If you’re not sure how to choose a flower girl here are some tips to find the right youngster. Flower girls are usually between the ages of 4-9. This isn’t a set rule, but a younger flower girl is less likely to make it through the day without a tantrum. Being a flower girl is a big responsibility for a youngster. A flower girl is usually a blood relative of either the bride or groom, it can also be a godchild or the daughter of a close friend or relative. If there is more than one little girl to choose from that’s better than one. Not only does it add to the cute factor, but there is strength in numbers. 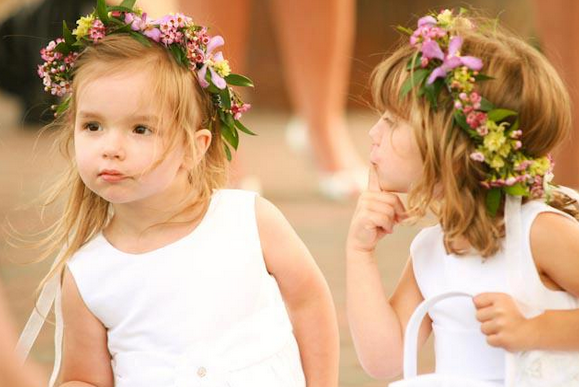 Two flower girls are likely to do better getting down the aisle than one. If possible give the flower girl/s a book on being a flower girl so they can learn about their responsibilities. Another good idea is to have them invite and attend as many of the bridal showers as possible so they can become comfortable with the other members of the bridal party. The flower girl dress is usually bought by the parents of the child, so make sure the dress isn’t too expensive. Flower girl dresses can be purchased from department stores and children’s clothing stores. The best time to find flower girl dresses are late February early March and late October and early November. On the day of the wedding be sure to put the flower girl’s parents in the front row aisle seat so they have someone they know and can focus on during the ceremony. Flower girls have typically thrown petals on the path to the altar, but they can carry little balls of flowers, a single flower, or even blow bubbles on their way down the aisle. Of course there’s no rule that says you have to have a flower girl, some couples even choose to have childless weddings. It all depends on what you want for your wedding, in some cases it wouldn’t make sense to have children be part of the ceremony or even attend the wedding. Just make sure that your guests know that you’re not planning to have children at the wedding so they can make arrangements for baby sitting. Whatever you choose to do, have fun and remember that there are no written rules to wedding planning. Every wedding is unique and that’s what makes them special.